What Does Syracuse’s Move Back to the 4-3 Defense Mean? Dino Babers released his week one depth chart earlier this week and one notable thing stuck out. For the time being, the Orange is switching from the previously reported 4-2-5 nickel defense back to its conventional 4-3. What that means is Syracuse will lose a defensive back (the nickelback) and add a linebacker to the field. While this by no means is a permanent switch, there is still a lot to draw from change back to the 4-3. First off is the matchup. Western Michigan is a far superior running team than passing. Last season, the Broncos finished ranked 21st in the country in rushing offense and 114th in passing offense, both ranked out of 129 teams. WMU only threw the ball on 37.3 percent of its plays, which was good for 110th in the country. It certainly helps to ditch the extra defensive back and add a linebacker instead, even if there is less experience. It helps to have the extra size with Andrew Armstrong’s size on the field. He stands a full six inches taller and more than 50 pounds heavier than nickelback Antwan Cordy, who has moved into the starting safety position instead. 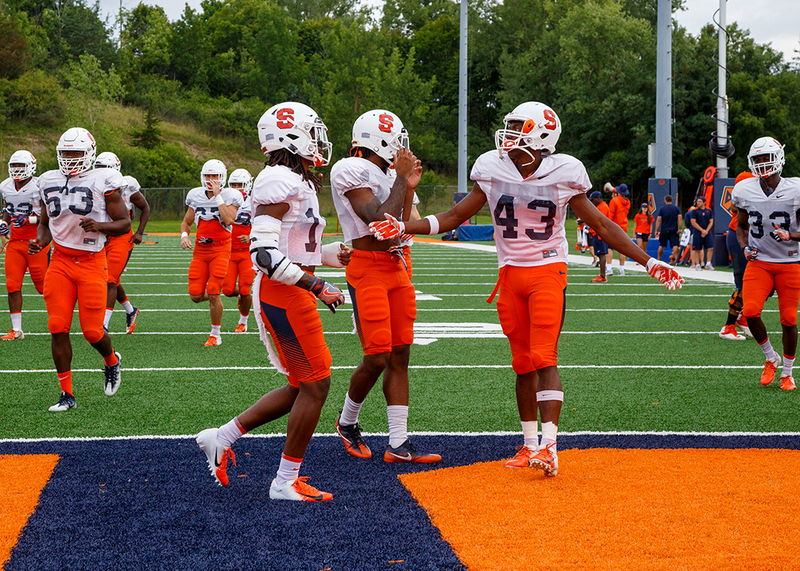 As we progress throughout the season, SU will face teams like NC State that boast much stronger passing offenses. That could signal a switch back to the nickel as the base defense, but don’t expect Babers to necessarily reflect that in the depth chart in order to not tip his hand. While the matchup certainly has played a factor, we have also heard Babers rave about the defense this offseason in scrimmages. It may mean that he has trust in his three inexperienced linebackers to get the job done, so moving back to a 4-3 would certainly make sense. Along with that, Andre Cisco began camp as the lone freshman slated to start. He has since been moved to the second strings behind Cordy at free safety. Maybe Cisco isn’t ready to be “the guy” at free safety quite yet, especially with the Orange opening the season against a team that was bowl-eligible last season.